Up until now every roller has just conveyed product forward, but with Crafty Tech’s ‘Steerable Roller’, product can now be selectively steered sideways whilst crossing a roller bed. This can be used to route products to multiple machines on demand, to diverge or converge product centres, correct upstream belt wander, or bias product to one side for example to optimise spiral freezer loading. Each steerable roller is made up from a number of rigidly fixed inclined wheel hubs, each with a rubber tyre running freely around its edge, driven via a friction drive by a common offset drive shaft. 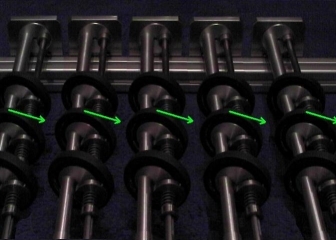 For example if the roller is turned so the wheel hub is leaning precisely to one side, then the tyre will drive straight ahead, but for other roller angles, the top of the tyre will produce a drive directed at an angle to the flow, as the series of pictures show. The ‘’Steerable roller’ was one of a number of patented product handling systems launched by Crafty Tech at the ‘Excellence in Food Manufacture 2004’ Conference at PERA in October.